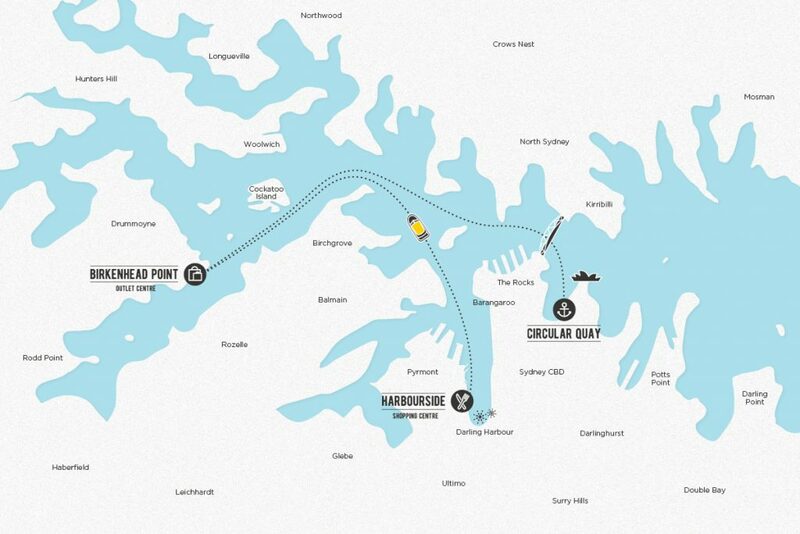 Hop, shop, dine, and play with services from Darling Harbour and Circular Quay to Birkenhead Point Brand Outlet. Cruise past Sydney icons including the Sydney Opera House, cruise under the Harbour Bridge, and past Luna Park and Cockatoo Island to reach the ultimate shopping destination, Birkenhead Point. Why not make a day of it? Shop till you drop at Birkenhead Point for up to 70% off at over 140 premium outlet brands including; Bally, Harrolds, Coach, Michael Kors, Oroton, Hugo Boss, Armani Outlet, Nike, Bonds, Calvin Klein, and plenty more, then continue the fun at Harbourside Shopping Centre with a variety of waterfront dining options with some of the best views in Sydney to suit every taste and budget. Top tip: Make sure to pick up your FREE Visitor Passport at Birkenhead Point Guest Services on Level 2 to receive even more savings and offers at Birkenhead Point. The Shopper Hopper runs seven days a week from 9:30 am – 4 pm. Click the book button for timetable information and to purchase your tickets and exclusive Shopper Hopper dining offers. Share your moments with us with FREE Wi-Fi on board. You can pay onboard or buy your ticket online. Is there any commentary and Wifi on board? Yes and yes, it’s free! Are there toilets on the vessel? Yes, there is a single toilet on board. What is the capacity on the vessel? Fantasea Explorer can carry up to 28 pax. Join Fantasea Cruising on the most authentic Sydney Harbour cruises, traveling between Darling Harbour and Circular Quay this is a daily scheduled cruise on Yellow Water Taxis.